To become an innovative landmark people can identify with in the present as well as in the future, the tower should not state a fixed message, but encourage people to invent their own interpretations of its meaning. To evoke multiple and diverse associations, it must be illusive and complex. 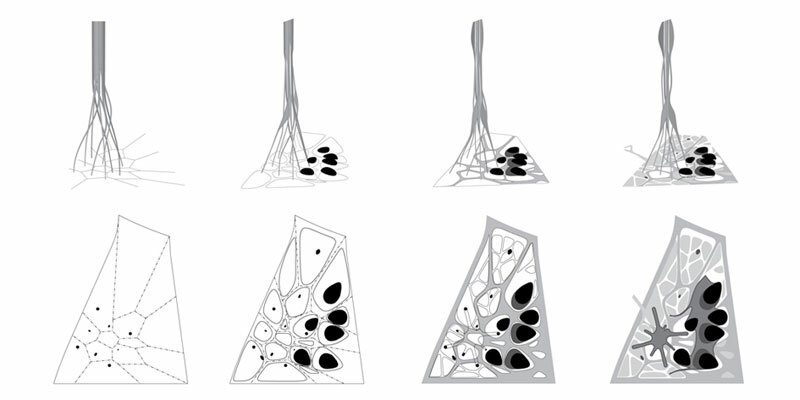 The fibrous tower emerges out of the interplay of many individual members, forming a synergetic whole and thereby establishing a new vertical typology. 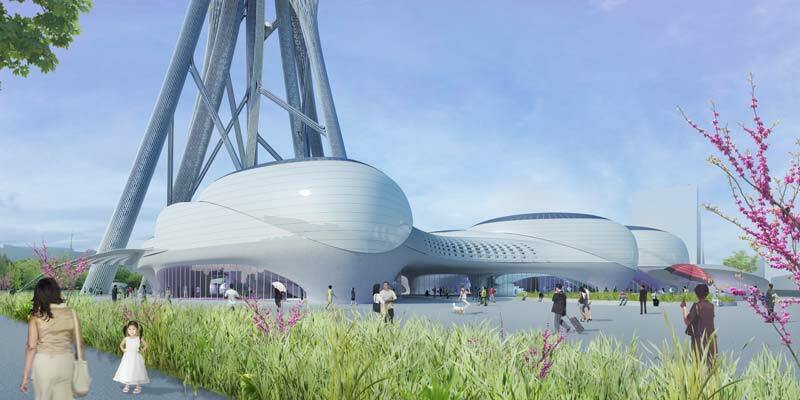 The structure is dissolved at the bottom, allowing the park landscape to flow freely between the tower legs. These create a non-hierarchical open field that is interpreted as a cell pattern. 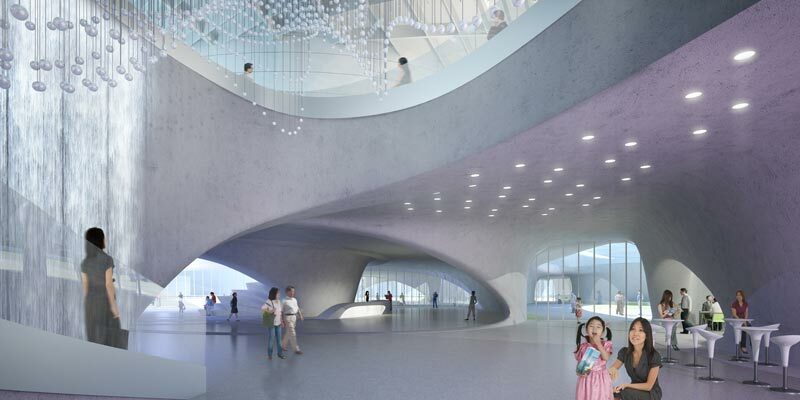 The cells produce the base layout for the building volumes, squares and green areas as well as networks of paths. 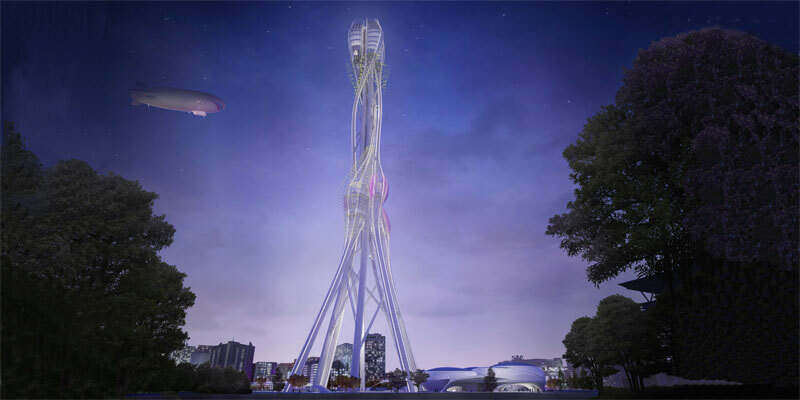 Each tower leg fulfills a particular function: the 4 inner ones contain all circulation facilities, such as panoramic elevators, fire elevators or emergency stairs. The outer legs create spaces for intermediate platforms and observatories by expanding. 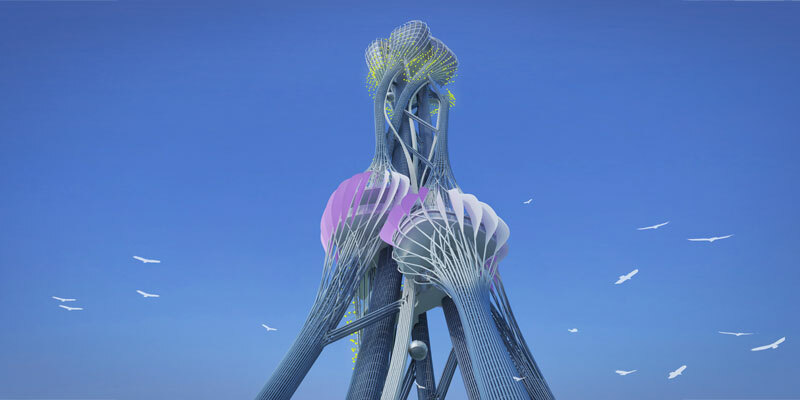 The potential of natural processes is used to create an evocative and multilayered tower appearance: Algorithms are applied in digital models to organize multiple members into one performative fibrous structure. 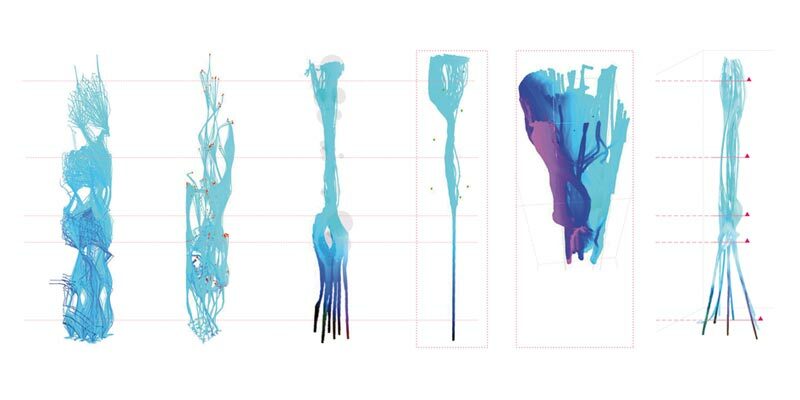 The design is evolved in a bottom-up approach, using swarm intelligence systems. The geometry of the tower emerges as one possible scenario from a solution space created by interactions among and between individual agents. The results were overlaid with functional requirements and further developed with the help of evolutionary structural software. 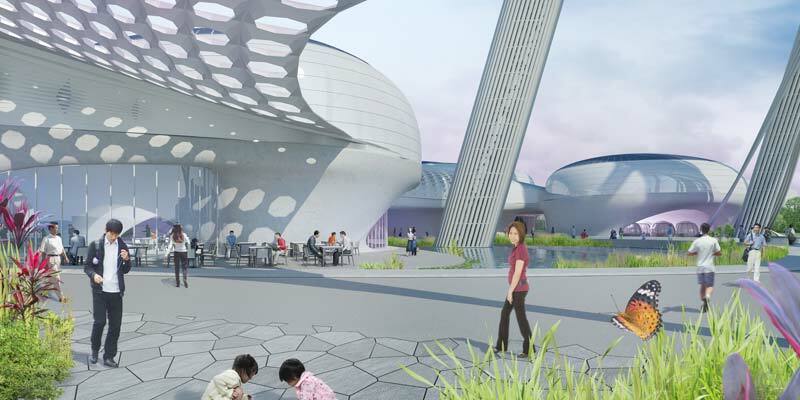 Taiwan Tower will become a sustainable icon displaying cutting edge technologies and innovations. 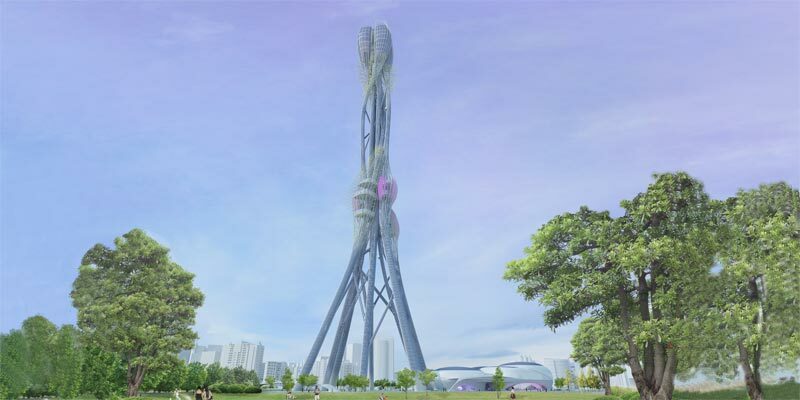 The “zero carbon” tower will be the world’s largest vertical absorber that functions as a self-sufficient system. 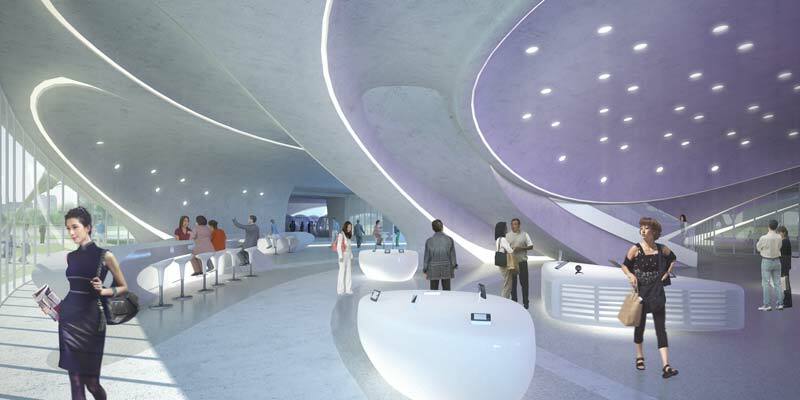 Furthermore, the tower turns invisible energy processes into a spatial experience and becomes an architectural statement: the need for reduction of energy consumption leads to architectural and spatial innovation.